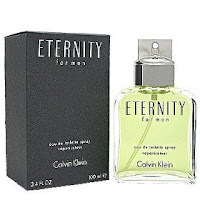 ETERNITY FOR MEN symbolizes the spirit of today's man: sensitive yet masculine, refined yet strong. Fragrance notes: greens, crisp jasmine, sage, basil, and rosewood, very refreshing and crisp. Recommended use: daytime.